First of all, let's define what kind of color claret is. Some believe that it’s purple, others think it’s plum, and some have their own personal opinion. Wikipedia says that it is "the color of wine from Bordeaux, darker and duller than scarlet." We will stick to this point of view. However, it is not necessary to limit yourself with definitions when choosing makeup colors. The main thing is to choose the most appropriate shade for you, whether it be red wine, plum, cherry, or any other color. Hollywood stars use claret a lot in their makeup, creating bold, extravagant, exquisite, and elegant images for public appearances. Look at the pictures of celebrities on the red carpet or at any premiere and you will see that celebrities use this color of lipstick very often. This color is relevant and is now at the peak of popularity. Let us follow the example of celebrities. So how do you create claret lip makeup? This makeup highlights the lips, so it is unnecessary to cover the eye in bright colors. Choose discreet, light eye shadows. Brown and natural shades of beige match claret lipstick the best. Black expressive wings look very good in combination with claret lipstick. Of course, you should put some makeup on the eyebrows and eyelashes. The perfect combination is smoky eyes in black and white colors. The lips will be the only bright color spot surrounded by monochrome makeup, which is very impressive. 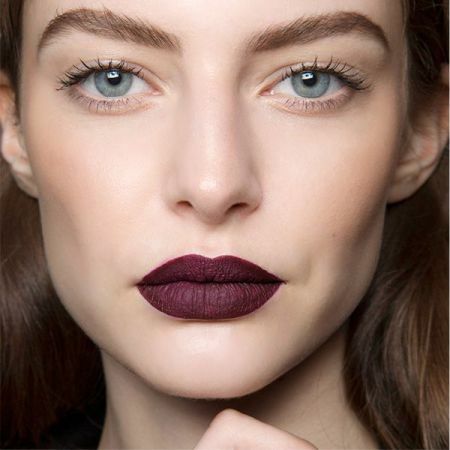 There is no need to create matte claret lips. You can add a bit of shine as this will add lip volume. In general, claret is ideal for full lips; it looks less advantageous on thin lips. If you choose a lipstick with shine, it is permissible to apply a little pearl eye shadow in the inner corners of the eyes which will make the look more mysterious and glowing. Claret is appropriate for evening makeup for receptions and parties, the New Year, theater, and so on. It would look too provocative, bright, and even vulgar if worn in the office. It is believed that claret is in perfect harmony with dark hair. However, women with light hair can also experiment with this color. The main thing is to choose the right shade. Do not forget about the lip liner to match with your lipstick. After learning how to create claret lip makeup and putting it on at least once, you will not be able to give it up! Like the article «How to Create Claret Lip Makeup»? Share it with friends!